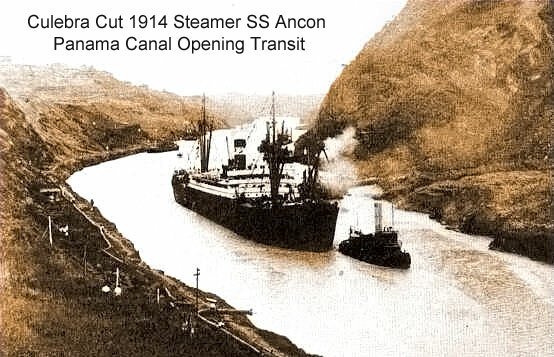 By August 15, 1914 the Panama Canal was officially opened by the passing of the SS Ancon. At the time, no single effort in American history had exacted such a price in dollars or in human life. The American expenditures from 1904 to 1914 totaled $352,000,000, far more than the cost of anything built by the United States Government up to that time. Together the French and American expenditures totaled $639,000,000. It took 34 years from the initial effort in 1880 to actually open the Canal in 1914. It is estimated that over 80,000 persons took part in the construction and that over 30,000 lives were lost in both French and American efforts. 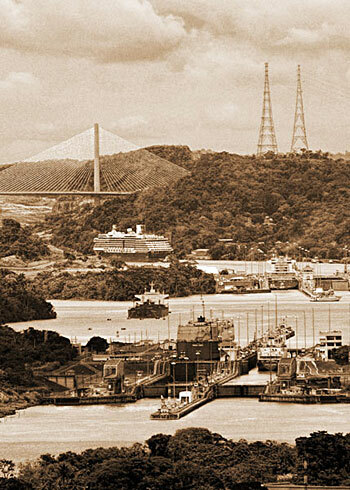 In the Year 2014 we celebrated the 100th Anniversary of the Panama Canal with a new section of historic and new images. is dedicated to all men and women who have and will work at or for the Panama Canal and made the heroic dream of over 400 years come true. Honoring the past by building the future. NEW: Panama Canal Photos Slideshow with 30 images from 2006 - 2015. Historic Photos including Panorama Views from 1886 until 1915 illustrating the Panama Canal Construction. Historic Documents, Prints and Postcards from 1494 until 1962 illustrating the Panama Canal History. Contemporary Photos including people at work, the bridges, ships in transit, Panama City and wildlife around the Canal. 1914 - 2014 100th Anniversary Panama Canal with images, videos and news updates comparing the past and present. For contemporary Panama Canal Stock Images please see this page here.